In the past two years, three exciting performance venues have opened in Orange County, and they couldn’t be more different: a public plaza, a campus concert hall and a music club. Those are bare-bones descriptions of, respectively, the Julianne and George Argyros Plaza at the Segerstrom Center for the Arts in Costa Mesa; the Marybelle and Sebastian P. Musco Center for the Arts at Chapman University in Orange; and the House of Blues Anaheim. But they also have much in common. Each venue adds depth to the county’s art scene and the potential for a greater variety of music, dance and theater. Each makes them more widely available to residents and visitors alike, in some cases through free performances. Here’s a closer look. The expansive courtyard between the original Segerstrom Hall, built in 1986, and the Renée and Henry Segerstrom Concert Hall, which opened in 2006, has been the site for dance performances, summer drive-in-style movie screenings and other events. But the center’s leaders had loftier goals for the space, hoping to turn it into a welcoming town square for the arts in Orange County where all events are free. 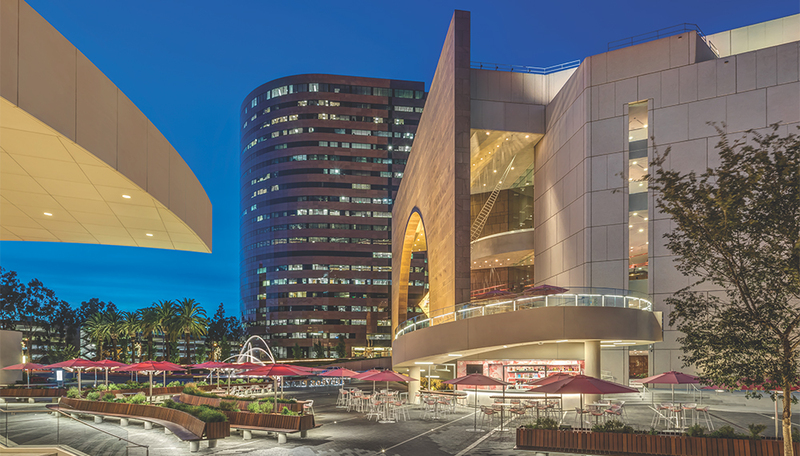 Segerstrom Center is ahead of the curve with its renovation: The Los Angeles Music Center recently announced a $40 million update for its plaza. The $16 million cost of the Segerstrom project includes a spectacular fountain at the plaza entrance and the new Center for Dance and Innovation. A focal point of the 56,100-square-foot plaza is a new permanent multipurpose area with audio and lighting equipment; it’s divided into two stages, one 2,100 square feet, the other 250 square feet. The plaza’s floor tiles and benches have embedded lighting and it’s dotted with 60 audio speakers. You can see and hear performers no matter where you are. Some preconcert events are tied to theater programming; the Hamiltunes Sing-A-Long on May 19 is timed to the run of the Broadway megahit Hamilton May 8-27. The space is also intended for school and community group performances, to foster their “ownership” of the center. South Coast Chinese Cultural Center and Pacific Symphony present a Lantern Festival on March 4 as part of Lunar New Year festivities. The plaza holds about 2,000 people. Benches of ipe wood dot the plaza; more than 40 Drake elm trees provide greenery and shade. There is seated dining at curvilinear new Patina Group café Center 360; there also are dedicated picnic areas. A grand staircase connects the plaza to a second-floor entrance to Segerstrom Hall. Los Angeles-based architect Michael Maltzan chose colors and materials to match existing features, notably Richard Serra’s reddish steel sculpture Connector. This landmark artwork is a favorite with children, who love to go inside the sculpture and listen to the echoes of their voices. The $82 million Musco hall opened March 19, 2016, with a gala starring opera greats Plácido Domingo, Deborah Voigt and Milena Kitic; maestro John DeMain led the L.A. Opera Orchestra. 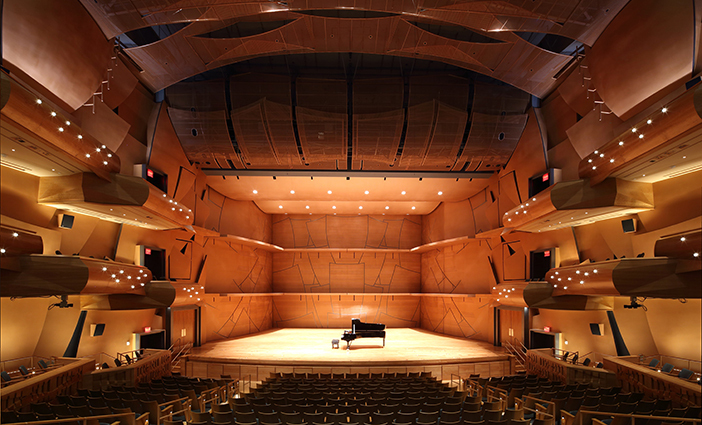 But the multipurpose auditorium, a showcase of wood and blue-fabric seating, was built as a flexible space that primarily serves the needs of Chapman University’s performing-arts students. Student productions make up about 30 percent of the presentations, says Richard T. Bryant, Musco Center’s executive director. 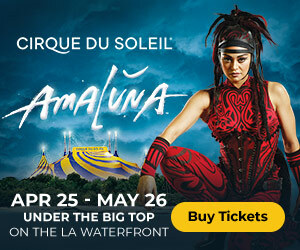 Pfeiffer Partners Architects Inc. designed the three-level, 1,044-seat theater so that it works equally well for opera—L.A. Opera is one of its artistic affiliates—as well as for concerts, theater, musical theater, spoken-word events and contemporary music such as pop and hip-hop. The orchestra pit accommodates as many as 70 musicians; the wood shell can be raised into the fly space above the stage when not in use. Famed acoustician Yasuhisa Toyota—whose projects include Walt Disney Concert Hall in Los Angeles and Soka Performing Arts Center in Aliso Viejo—designed acoustical banners within the hall that can be adjusted to suit each presentation. Musco officials hope to attract diverse communities. To that end, they have forged artistic relationships with the Vietnamese American Society for Creative Arts & Music, the Orange County Youth Symphony and Backhausdance, whose director, Jennifer Backhaus, is an assistant professor on the dance faculty at Chapman University. Star choreographer Benjamin Millepied and his L.A. Dance Project participate in a weeklong residency that culminates in a performance of new works June 16. Jazz phenomenon Joey Alexander and his trio perform April 27; the Heartbeat of Mexico festival May 27 concludes with a ticketed evening performance. The House of Blues at “eatertainment” center Anaheim GardenWalk, the acclaimed chain’s first new location in 10 years, is twice the size of its former space at Downtown Disney. With the close of the House of Blues in West Hollywood, the jaw-dropping Anaheim edition has become HOB’s flagship. On some nights, House of Blues has live music scheduled in four different rooms. The large Music Hall seats 2,200, ideal for groups such as the rock band Dashboard Confessional on April 20. The popular Sunday Gospel Brunch takes place in the Music Hall, too. 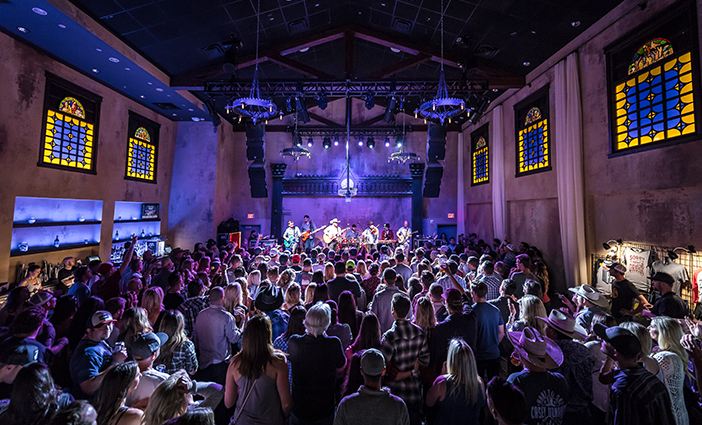 The Parish room is a more intimate space for local artists and smaller bands; it holds 400 and can be configured for lounge seating or standing-room only. The Foundation Room is a VIP membership live-music venue and lounge—varying prices include concierge service and premium seating—that also has public hours. The ground-floor restaurant and bar has a stage featuring different musicians daily. The focus of new chef Jeremy Cantwell’s menu remains on made-from-scratch Southern-inspired dishes. It wouldn’t be the House of Blues without a Southern vibe and décor that pays homage to the Mississippi Delta and the great bluesmen of the past. Delightful folk art crowds the walls; glass tiles in the restaurant and bar celebrate greats such as Etta James and B.B. King; tapestries hang on the mezzanine level of the Music Hall. A spectacular pillar at the entrance to the club, adjoining the downstairs bar, is intricately decorated with thousands of beads, giving it a Mardi Gras spin.